Are These RobOTic Technologies Revolutionizing Stroke Therapy? With the ever-expanding world of technology, it’s only fitting that we assume robots will eventually attempt to take over our profession, right? At only a 0.35% chance of becoming automated (Barber, 2017), OTs should remain gainfully employed in the years to come . . . as long as Boston Dynamics stays out of the therapy-robot world, that is. Robots are starting to make their presence in our OT world, but maybe not in the capacity that popular sci-fi would suggest. 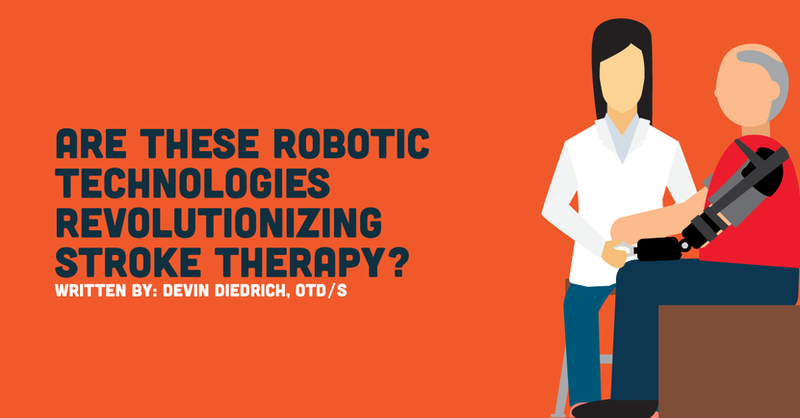 According to Chang and Kim, robotics have become increasingly popular in the therapeutic circle and the authors stated that, “robotic rehabilitation therapy can deliver high-dosage and high-intensity training, making it useful for patients with motor disorders caused by stroke or spinal cord disease” (2013). If we think back to what we learned in school about neuroplasticity of the brain, we know that 400-600 repetitions of a specific movement are needed for the brain to start rerouting the damaged pathway of the nervous system (Kimberley, T. J. et al, 2010). Rerouting damaged pathways = neuroplasticity! Robot therapy capitalizes on this concept of neuroplasticity, which ultimately helps people improve their functional capacity after stroke, secondary to creating an environment that encourages neuroplasticity with high repetitions and intensity of retraining the damaged nervous system pathways. How do we know neuroplasticity is possible after stroke? Many studies have been completed over the years exploring the brain’s ability to recover after an injury such as a stroke, but today we’ll explore an article that is particularly memorable from my neuroscience course. A study in 1996 completed by Nudo and Milliken used brain imaging and functional outcomes to see how the brain can adapt when recovering from a stroke. Essentially, Nudo and his team gave monkeys strokes via purposeful occlusions with microforceps connected to a bipolar electrocoagulator (the 90s were savage!). Some monkeys received no therapy, and others completed rehab (think CIMT*-esque). The images were compared from three different time points: pre, post, and three-month follow-ups. Nudo and his team found via the brain mapping and imaging that the brain had an ability change its connecting pathways in attempt to help remediate the damaged routes created by the occlusions! In the monkeys who received rehab, the imaging showed that the brain had remapped in a way that helped the monkey function, despite the stroke. What about the robots, though? Okay, yes, FINALLY the robots. As one could probably infer, all of the aforementioned terms and principles are important to understand when exploring the use of robotics for stroke rehabilitation. Although it’s a fun idea to entertain, C3PO is not conducting OT sessions with someone to help remediate hemiparesis. Active systems provide movement assistance along a defined trajectory (think powered by motors on designated route). Passive systems help support the weight of the limb during movement attempts (think gravity-minimized plane during MMT). Interactive systems use actuators and motors in combination with impedance and control strategies to allow the robot to react to movement attempts (think high-tech and expensive). Robotic devices can also be categorized into exoskeletons and end-effectors. Exoskeletal devices have multiple points of contact between the person and the robot, while an end-effector device has one distal connecting point. Exoskeletal devices can be small and worn during functional tasks (i.e. Bioness, MyoPro, SaeboFlex/SaeboGlove), and others are large and more stationary (i.e. ArmeoSpring by Hocoma, WREX). End-effector robots would be devices such as the Amadeo (for hand rehabilitation) and BURT. Overall, remember that “exoskeleton vs end-effector” refers to the fit and points of contact between the person and the device, and “active vs passive vs interactive” refers to how the device moves and interacts with the person. Robots such as the Armeo Spring, WREX and BURT help support the weight of the arm against gravity. With the affected limb in a gravity-assisted position, the weakened muscles can then work to move the arm, ultimately moving through motor pathways they otherwise could not execute. From high-intensity and mass practice of moving through these pathways, the nervous system has better circumstances for neuroplasticity to improve the person’s overall use of the arm. Now, there may be the rare occasion of a wealthy prince in a faraway land who wants to buy an Armeo Power for his recovering father; however, the rest of us normal human beings need more practical methods of accessing these technologies. One common route people are able to access robotics for rehabilitation purposes (especially the fancy, expensive ones!) is through participating in research studies at teaching hospitals and universities. Grants and other stakeholders in the organizations typically fund these studies, so they are more likely to have these technologies than say, a small, privately owned clinic. Live in a place like Boston, MA, Los Angeles, CA or New York, NY (Bauroth, 2014) and you may be in luck! Chances are much higher that you’ll be able to find some type of hospital, school or organization proudly sporting a robotic rehabilitation device. So what about the farmer in middle America trying to recover from a stroke within the comforts of his hometown of 800 people? No robots for you, sorry. I’m kidding! . . . sort of. People in more rural areas definitely have more barriers with accessing these robots, but it’s not impossible. Many of the companies offer demos where they travel to clinics and share their device and let the clinicians trial it. Some offer rental programs for a lower cost so a clinic or rehabilitation hospital may still have the device for a designated amount of time without committing to the full purchase price. With some of the smaller devices, such as the SaeboFlex and SaeboGlove, there’s a higher percentage of users willing to fully purchase the product. The Saebo products not only are exponentially cheaper than the Hocoma products, but they also can be worn during functional activities to increase occupational performance. The SaeboGlove can be purchased for $299, offers a relatively low profile, and can be great for helping someone decrease flexor tone of the hand while increasing ability to release a grasp (Saebo, 2018). The Saebo company offers several devices, all that are available with a 30-day, risk-free trial. Not a bad trade-off considering the price of the larger, stationary devices! Another important piece to keep in mind, is that although insurance may not cover the cost of the device, it DOES cover therapeutic use of the device. Currently, there are no billing codes for “robot therapy,” but clinicians often bill for it under "therapeutic exercise"(97110) or "neuromuscular re-education" (97112). So if you can get your hands on a robot, know that your time will be reimbursed when using it with a client. Although some of the evidence surrounding robot therapy is inconclusive, many articles have found that using robot therapy in addition to conventional therapy is most helpful for increasing functional and meaningful use of the affected shoulder and elbow (Norouzi-Gheidari, Archambault, & Fung, 2012; Sale et al, 2014). Some studies have compared people in chronic stroke with the use of conventional therapy or robot therapy, finding that robot therapy may increase things like strength but does NOT improve function (Klamroth-Marganska et al, 2014). This may be the biggest issue thus far with robot therapy, and further justify the need for conventional therapy as well. After all, our job is to help improve function and it’s doubtful that robot therapy can do that alone. It takes a compassionate heart, clinical judgment, and collaborative care to truly make a difference in someone’s recovery, and those are things that robots simply cannot duplicate. As new grads, we often face situations where we feel intimidated, inexperienced or even anxious about wanting to do (and be!) our best. One key aspect that I believe new grads always have to offer is our excitement, eagerness, and passion for OT! If you find yourself in a clinical setting where a device may benefit your clients, be the catalyst to get what you (THEY) need! Capitalize on your OT-passion and advocate for your clients, yourself as a therapist, and our profession. OT isn’t going anywhere, as robots will continue to be a supplemental service to our skilled care.